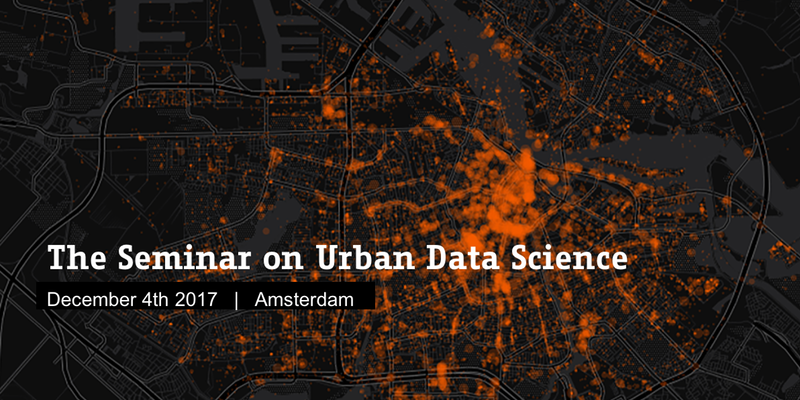 The AMS Social Urban Data Lab (SUDL) is organizing the 1st European Seminar on Urban Data Science on December 4, 2017 at the Amsterdam Institute for Advanced Metropolitan Solutions (AMS). With modern-day cities comes a diverse array of geosocial big data from location-aware technologies. These range from sensing devices, GPS trackers, and satellites through to social media, mobile phones, fleeting transactions, as well as massive government and public data repositories. Together, they provide an exciting reflection of the human landscape. The more knowledge we can derive from geosocial big data, the better we can address real-world urban and regional challenges. Urban data science is a burgeoning field that has emerged in support of new, geographically-focused computing and data science. It couples theories and methods from urban planning, geography, and computer science to capitalise on the increasing demand for efficient location-based services for cities and metropolitan regions. The seminar brings together leading experts in the fields of quantitative geography, data science, computational social science, and urban planning, from both academia and practice, to discuss the present and future of (spatial) data science applications in urban and regional contexts. The corporate smart-city rhetoric is about efficiency, predictability, and security. “You’ll get to work on time; no queue when you go shopping, and you are safe because of CCTV cameras around you”. Well, all these things make a city acceptable, but they don’t make a city great. We are launching goodcitylife.org – a global group of like-minded people who are passionate about building technologies whose focus is not necessarily to create a smart city but to give a good life to city dwellers. The future of the city is, first and foremost, about people, and those people are increasingly networked. We will see how a creative use of network-generated data can tackle hitherto unanswered research questions. Can we rethink existing mapping tools [happy-maps]? Is it possible to capture smellscapes of entire cities and celebrate good odors [smelly-maps]? And soundscapes [chatty-maps]? Western health systems are increasingly faced with lifestyle-related diseases such as overweight and obesity. Due to a lack of daily physical activity, being overweight is particularly alarming for the young cohorts and is even more serious because it is expected that a less active behavior is retained in adulthood affecting societal well-being in the long term. To reduce health risk factors the daily journey from residential location to elementary school is seen as a significant contribution to achieve the recommended daily ratio of active movement. Therefore, health agencies show great attention to encouraging children in active transportation modes, i.e. cycling or walking. Despite the apparent importance of the geospatial context and environmental exposures in general and urban design, in particular on cycling and walking, comprehensive knowledge on how these factors are related to children’s active transportation and how they are experienced during transit are lacking. Utilizing GPS data of approximately 100 children in socially deprived neighborhoods located in five Dutch cities, the research objective is to empirically evaluate the impact of urban morphology and design on children’s active mode choice, travel distance, and travel duration. Based on GIS-analysis and the space syntax approach, indices are operationalized to describe urban environments. While controlling for the children’s socio-economic characteristics, the individual and multivariate impact of the build-up environment on mode choice, travel distance, and travel duration is explored through generalized additive (mixed) regressions. Based on these preliminary findings, the talk concludes with recommendations for spatial planning authorities to support a healthier urban living. In an era of smartening cities, urban stakeholders are under increasing pressure to derive insight from the mass of new data that are being generated about human dynamics and their contexts. Many new forms of data concern explicitly spatial phenomena, yet many contemporary methods do not account for many of the unique properties of data with geographic attribution. This talk will present an overview of examples from the University of Liverpool Geographic Data Science Lab where we are developing new insight into the dynamics of urban form and human behaviour through the combination of machine learning and explicitly spatial methods. The idea of reproducible research has gained much recent attention. This is an approach to publishing reports, documents and web sites relating to data analysis in which complete information regarding the data used and the programming scripts used to perform the analysis are encapsulated in a single object. The idea is that third parties can not only read the report (or web site) but they can also reproduce any analytical results or visualisations included in it. This allows the scrutiny of methods used, as well as the adaptation of methods for different data sets or similar but distinct statistical analyses. In this talk the key ideas and justifications for reproducible research will be discussed, together with a description of a practical implementation of a reproducible research framework based on the R programming language, together with RStudio and RMarkdown and some related tools. In addition to this, some examples of ongoing work using a reproducible paradigm will be given, including an open and reproducible geodemographic classification for the Republic of Ireland, and a related approach to creating dashboards. Urbanization is progressing fast, and it is estimated that by 2050 almost 70% of the total global population will live in cities. This process is expected to bring important advantages, including more efficient running of public services and better living standards for its citizens. However, if not properly managed, it risks aggravating existing issues, such as traffic congestion, environmental pollution, and social inequality. By acquiring, integrating, and analysing large amounts of heterogeneous data, generated in urban spaces by a diversity of sources, such as sensors, devices, vehicles, buildings, and humans, rich knowledge about the functioning of our cities can be derived and used to improve the quality of life of its residents. Drawing inspirations from different fields, including urban planning and economics, Licia will illustrate the models she has built to understand the nature of urban phenomena, with specific applications to inequalities measurement, urban planning, and sharing economy regulation. data analytics, and media creation. I will discuss experiences with mobile crowdsourcing, in which youth make visible urban issues that matter to them. Integrating mobile sensing, audiovisual media, and content analysis, the goal is to enable reflection processes through which discussions to rethink and act on urban issues can emerge. I will argue for the need to work beyond single disciplines and to seize the opportunities that arise from working with communities — both to contribute to the public good and to advance socio-technical approaches involving citizens and cities. Within scientific projects, a lot of interesting and potentially valuable data is being gathered and analyzed, but often only shared within the project or scientific community. From experience with academic, public and commercial projects, Wouter will share CLEVER°FRANKE’s insights on how to turn that data into data visualization projects that have communicational value. This can be focused on sharing insights, attracting interest in the project or showing the potential of the datasets. The presentation will include a framework on how to classify and ideate types of visualizations with different purposes, as well as examples of past projects. The seminar is free to attend, however registration is required.